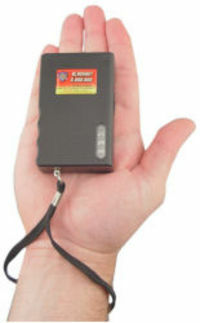 The Blackout 5,000,000 Stun Gun is one of our most powerful stun guns. Its rubberized shell makes it easy to handle and grip. The unit is rechargeable (rechargeable batteries are included) with a built-in plug for easy charging. Check Stun Gun Laws for legality in your area. There are no cords to keep up with; simply plug into a standard wall outlet. To help prevent overcharging an LED light lets you know when it is fully charged. It also has a built-in bright LED flashlight for a convenient source of light. The unit comes with a safety switch to prevent accidental discharge and an optional disable pin to prevent the stun gun from being used on the victim in case the attacker takes the device (a plug is included if you prefer not to use this feature). The disable pin adds an additional safety feature for parents; removing the disable pin prevents a child from accidentally turning the stun gun on if they happen to find the unit. A stylish, durable holster is included for easy carrying. Dimensions are 3 and one-half inches x two and one-eight inches x seven-eight inches. The SF5000RB comes with a lifetime limited warranty. Actual voltage output is difficult to measure and verify, but this unit compares to other brands that claim to be 5,000,000 or more volts. The actual voltage emitted by any stun gun is difficult to measure but recently many stun guns have come to the market that claim to be millions of volts. We wanted to show that the output of our model is similar to others which claim to emit 3,000,000 volts. However, we wanted to be careful to not make an exaggerated claim which can not be verified so we have chosen to use 3,000,000 as a model number and not as a measure of voltage. Please contact us is you have any additional questions. GLC Enterprises, Inc. warrants each new () unit for a lifetime-limited-warranty against defects in materials or workmanship with the following exceptions: The rechargeable batteries are warranted for 2 years from the date of purchase. The warranty does not cover damage resulting from accident, misuse or abuse, lack of reasonable care, moisture, the affixing of any attachment not provided with the product, loss of parts, or recharging the unit not according to the instructions listed in the manual (which comes with each unit). Tampering with and/or opening the unit, or the use of unauthorized replacement parts unless by an Authorized Dealer will void the warranty.